The U.S. religious landscape is already in the midst of some dramatic changes when it comes to the growth or decline of people with certain religious identities. And while it is impossible to predict exactly how that landscape will shift in the future, some key demographic factors — particularly age — can provide a clue as to how things might unfold in the coming decades. For example, religious groups whose members are younger may be more likely to grow, not only because those members will live longer, but also because more of them are still of childbearing age (and thus have a greater chance of passing on their religion to their descendants). With this in mind, some of the groups that have already been growing in recent years may be primed for continued growth. This includes people with no religious affiliation: The median age of adults who say their religion is “nothing in particular” is 38, while for atheists and agnostics it is 34. Overall, these three groups together (often called religious “nones”) have a median age of 36 – fully a decade younger than the median age of U.S. adults overall (46), according to data from our 2014 Religious Landscape Study. Members of some non-Christian faiths also are very young – U.S. Muslims and Hindus in the survey each have a median age of 33. About four-in-ten Muslim adults in the U.S. are under the age of 30, and nine-in-ten Hindu adults are under 50. At the other end of the spectrum, members of two Presbyterian denominations are among the oldest of the 30 religious groups we were able to analyze, which include Protestant denominations, other religious groups and the three categories of people who are religiously unaffiliated. 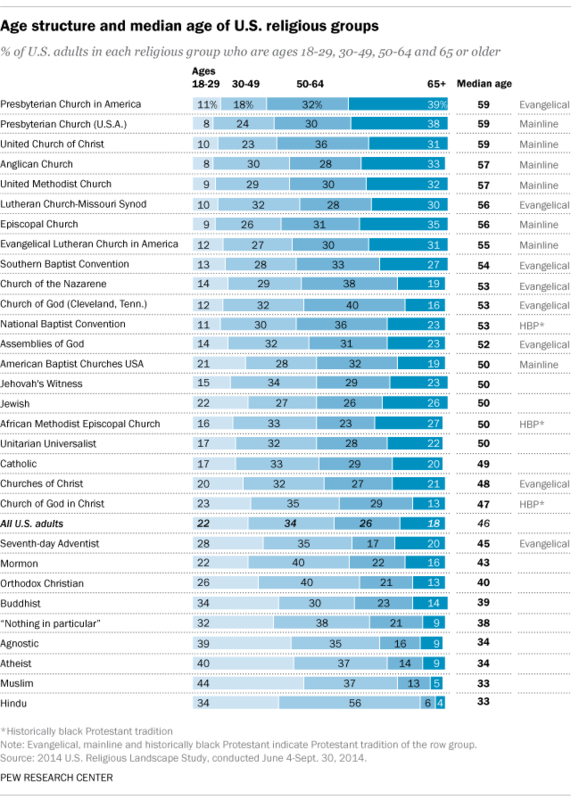 The median age of adults who identify with the Presbyterian Church in America (an evangelical denomination) and the Presbyterian Church (U.S.A.) (a mainline denomination) is 59 for each group, identical to the median for members of the mainline United Church of Christ. Only about one-in-ten adults in these denominations are under the age of 30; the same is true of Anglicans, United Methodists and Episcopalians and members of the Lutheran Church-Missouri Synod. Mormons, Orthodox Christians and Seventh-day Adventists, meanwhile, are relatively young compared with most other Christian groups. Of course, age is not the only factor in future growth patterns of religious groups, meaning that younger groups may not necessarily grow (and older groups may not shrink) as a share of the population. Fertility rates, religious switching, immigration and other factors also come into play. For a full discussion of these factors, see our 2015 global population growth projections for religious groups.